When you want to create a box or line in QuarkXPress that’s more complex than a simple rectangle, oval, or starburst, you enter the realm of the Bézier path. If you’ve used the Pen tool in Adobe Illustrator or Photoshop, you already understand Bézier paths. It takes some practice and a relaxed mind to grasp how to use Bézier tools, so don’t be surprised if you feel a little frustrated at first. Pierre Bézier was an engineer at the French automaker Renault who patented and popularized a way to control smooth curves. Activate the Bézier Pen tool in the Tools palette and then click to drop the first point anywhere on the page. Move the pointer to where you want the next point. Click to create additional points and line segments. To create a straight line and corner point, click without dragging. To create a curved line segment and smooth point, click and drag where you want the next point positioned. A point with two curve handles appears, and you can control the curve’s shape by dragging a curve handle. To create a point that connects a curve to a straight segment, press Option (Mac) or Alt (Windows) while dragging a smooth point. This creates a curved segment and corner point. To add a point to an existing segment: Click the segment where you want the point to be. To delete a point from the shape while you are drawing it: Click the point. To complete the box, close the path by positioning the mouse pointer over the beginning of the path; then click when the pointer changes to the Close Box pointer. The Close Box pointer looks like a pen nib with a tiny diamond at its bottom right, as shown here. When any of the drawing tools are active, you can temporarily switch to the Select Point tool by pressing Command (Mac) or Ctrl (Windows). When the Select Point tool is active, you can temporarily switch to the Item tool by pressing Command-Option (Mac) or Ctrl+Alt (Windows). Bézier Pen: This is the main tool for creating Bézier lines and boxes. To constrain its angle to 45 degrees, press and hold Shift while drawing. To adjust or edit a Bézier path, use the tools described next. Add Point: Adds a point to an existing line segment. Adding a point to a regular (non-Bézier) content box automatically turns the content box into a Bézier item. Remove Point: Removes a point from a path. Convert Point: Automatically converts corner points to curve points, and curve points to corner points. Click and drag to change the position of a point, the curve of a curved-line segment, or the position of a straight-line segment. Click a rectangular box or straight line to convert it to a Bézier box or line. Scissors: Cuts an item into separate paths. You can use the Scissors tool to cut the outline of a box and turn it into a line, or to cut a line or text path into two. When you cut a picture box, it is converted to a Bézier line and its content is removed. When you cut a text box, it is converted to a text path. When you cut a text path, it is converted into two linked text paths. Select Point: Selects curves or points so that you can move them or delete them. Shift-click to select multiple points. Hold down Option (Mac) or Alt (Windows) and click a point to make it symmetrical. If you can’t get the hang of using the Pen tools, try the Freehand Drawing tool, which creates a smooth curve as you drag your mouse around the page. If you finish a drawing by ending on the beginning point, the drawing becomes a box; otherwise it remains a line. To automatically close a freehand drawing with a straight-line segment, press Option (Mac) or Alt (Windows) before you release the mouse button. QuarkXPress gives you several different ways to edit the shape of a Bézier shape, including choosing one of the standard QuarkXPress shapes from the Item menu and using the Select Point tool or Bézier Pen tool in the Tools palette. I describe these three techniques in the next sections. To change the shape to a standard rectangle, oval, or line, choose Item→Shape and choose the desired shape from the Shape menu. To select curves or points so that you can move or delete them, use the Select Point tool. Shift-click to select multiple points. Hold down Option (Mac) or Alt (Windows) and click a point to make it symmetrical. To add a point to a Bézier box while working with the Bézier Pen tool, click a line segment or use the Add Point tool. To remove a point from a Bézier box while working with the Bézier Pen tool, click the point or use the Remove Point tool. 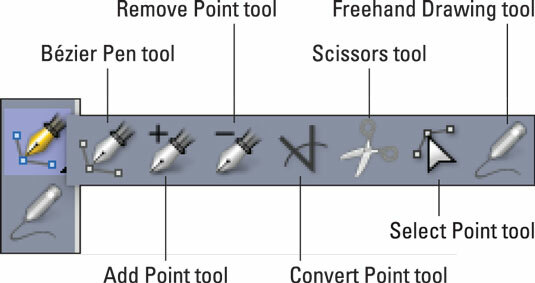 To convert a point to another kind of point while working with the Bézier Pen tool, Option-click (Mac) or Alt-click (Windows) the point or use the Convert Point tool. To move a point or change the shape of a line segment while working with the Bézier Pen tool, hold down Command (Mac) or Ctrl (Windows) and drag the point or line segment. To pan the layout while a Pen tool is selected, press Shift+Spacebar and then click and drag. Now that you’re all hot about making and editing Bézier shapes, here’s a trick to converting an existing box or line so that you can reshape it with the Pen tools: With the item selected, choose Item –> Shape. If your item is a box, choose the shape from the Shape submenu that looks like a painter’s palette. If your item is a line, choose the curvy line. After that, you can use any of the Pen tools to reshape your item to infinity and beyond. You can also convert a regular box or line into a Bézier item with either of two Pen tools: Just click a line segment with the Add Point or Convert Point tool.